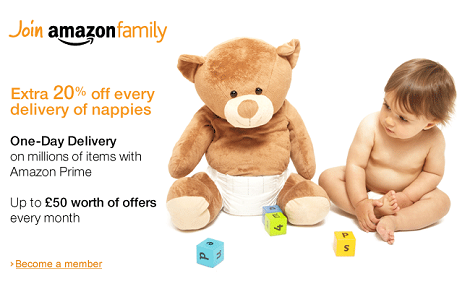 Amazon UK Family members with an Amazon Prime membership receive 20% off nappies through Subscribe & Save. Simply select the “Subscribe & Save” option on the product page of any of these products and you will receive 20% off all subscriptions. If you have an Amazon Family membership but not an Amazon Prime membership you can upgrade by selecting “Upgrade membership” from the Your Amazon Family membership page. Amazon Family Terms & Conditions and Subscribe & Save Terms & Conditions apply.